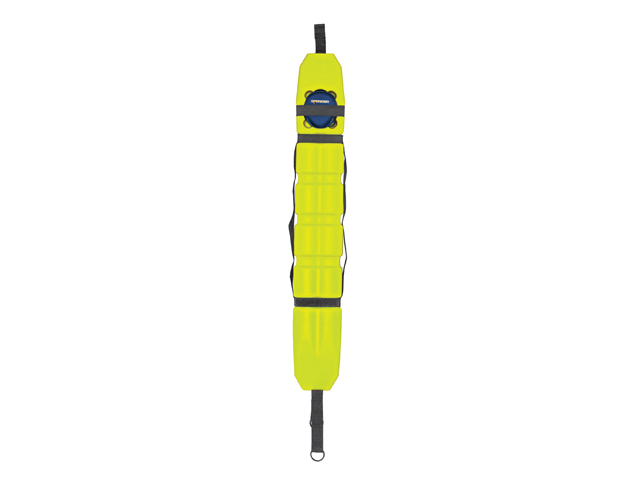 Made of closed-cell, self filming polyurethane foam, it has a higher flexibility and resistance than any other type of rescue tube, therefore able to adapt to rescue victims of any size. Dolphin has three separate but at the same time fundamental functions: it can be wrapped around the casualty for water rescue; it provides emergency resuscitation thanks to the Flex Mask stored in its own housing on the device and last but not least it also has a space for fin storage. The design studies have led to the development of a wave-shaped form, which ensures a firm grip, easy to bend and the redistribution of weight, correctly balanced to assist superior range high performance throwing.